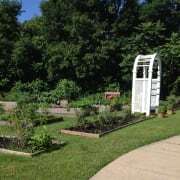 Join our little community by participating in our Community Garden located at our Enrichment Center in Brentwood. Adopt a plot, plant vegetables, flowers, etc. The cost is $20.00 for the season and we ask that you donate 10% of the produce to a local soup kitchen or food pantry. We supply the space, the tools, irrigation. You supply the plants, the labor, your imagination and enthusiasm. Additional details available.